In some cases, app users simply have access to your application: they can sign in, enter data, run reports, and so forth. However, you may have developed a project management app that allows you to assign tasks to your users and track their progress. You'll probably want to select those from a list of app users. For apps like this, Quick Base lets you create user fields, which list your app's users in a dropdown list. The values in a user field represent Quick Base users who have access to the app. This means that you can perform a lot of nifty tricks with user fields. For example, when a new task is created, you can specify that Quick Base send an automated email notification to the user listed in some user field. You can also control access permissions with user field values, or use them to create reports to show a user in your app the records that matter to them. A user field lets you select one user from the dropdown. 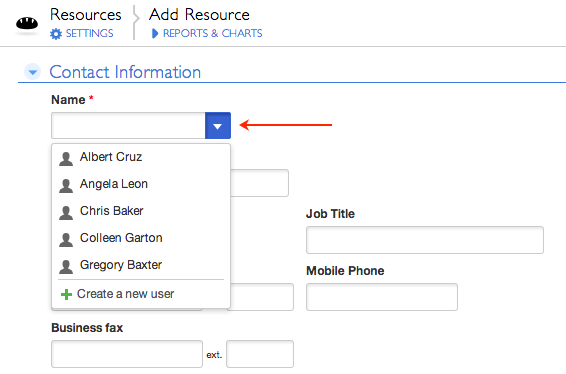 Quick Base also offers a list-user field that lets you select multiple users from the dropdown. List-user fields work in much the same way as user fields; however, there are some restrictions. Read more about list-user fields. Which users appear in a user field? Use the Default Set of users. Create a Custom Set for a field. For any user field, you can set a field property that tells Quick Base to use a custom set of users defined for that field. On the Manage Users page, look in the Show in User Pickers column. A green checkmark indicates that the user in that row is a member of the default set, and appears in user fields that use the default set. To remove a user from the default set, deselect the checkmark in that column. Click the table name in the table bar of your app. Click SETTINGS in the page bar, then click Fields under Table Structure on the Settings page. Click the field name to access a field's properties. Under User field options, select Custom user set. Quick Base displays a list of all of the users currently in the default set. Modify the set of users as desired, using the Add Users and Remove User buttons. Note: When you allow your users to create new users from within a User field, the Find more people command will (by default) search through all users in the app, all users in your company's email domain(s), and all users with access to your account or realm. To restrict the places where this command will search, Click App properties, click Advanced Settings, and in the Options section, click the checkbox for Limit the user picker's "Find more people" to finding users in the company who are not in the app. What if a user field is a reference field? If you've established a relationship between two tables, and one table includes a reference field that's a user field, the default or custom set of users won't be reflected in the reference field dropdown. In the details table, the dropdown for the reference field includes only those users you have added to the master table. Built-in fields that contain user data (like Record Owner and Last Modified by) don't let you create a custom user set, because to function properly, they must include all application users. For example, if a user is not in the Default Set, but creates a record (and therefore becomes the "record owner"), Quick Base must be able to record that user's information. What do the icons beside the user names mean? - The user has access to the app. - The user does not have access to the app (but you could add them). - The user has been denied access to apps in your account. - The user is a placeholder user.